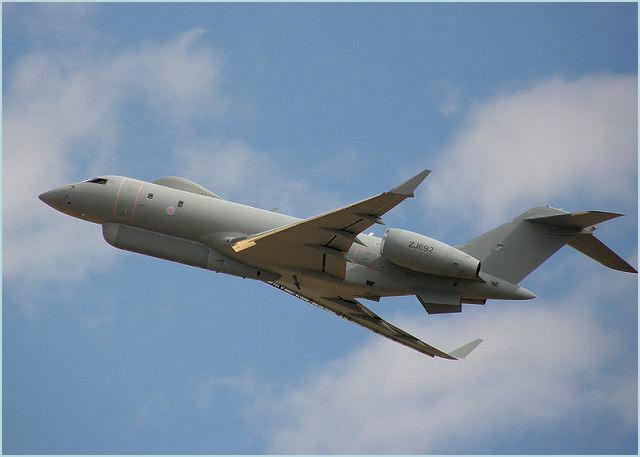 The Raytheon Sentinel R1 is a Bombardier Global Express modified as an airborne battlefield and ground surveillance platform for the British Royal Air Force. 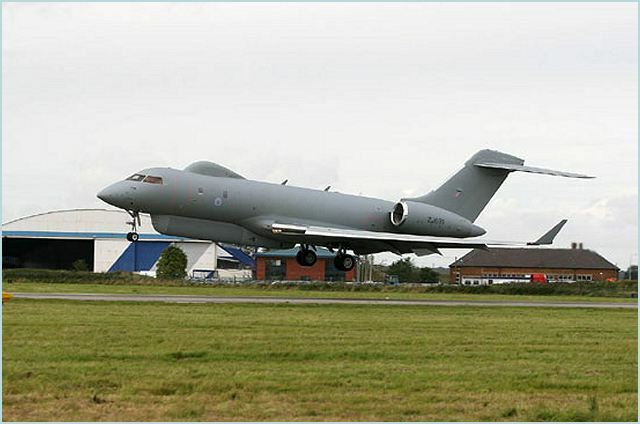 Originally known as the ASTOR (Airborne STand-Off Radar) programme the aircraft is operated by a RAF squadron manned by both air force and army personnel. 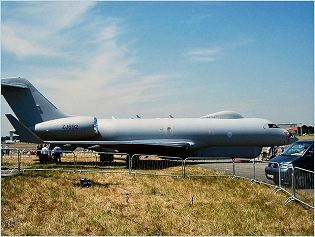 The first flight of the modified prototype was in August 2001, which validated the modifications required for the ASTOR system. 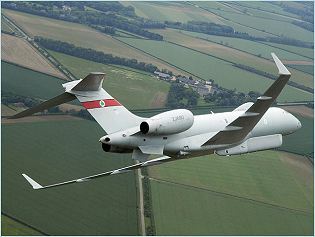 The first production Sentinel R1 made its 4.4 hour maiden flight on 26 May 2004. 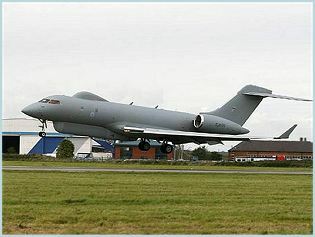 The aircraft entered operational service with V (Army Co-operation) Squadron of the Royal Air Force based at RAF Waddington and flew its first operational sortie in Afghanistan in February 2009. The system provides a highly effective 24-hour surveillance and target acquisition capability. It delivers wide area, all weather surveillance and reconnaissance imagery in near real time for peacekeeping, warfighting and homeland security needs. 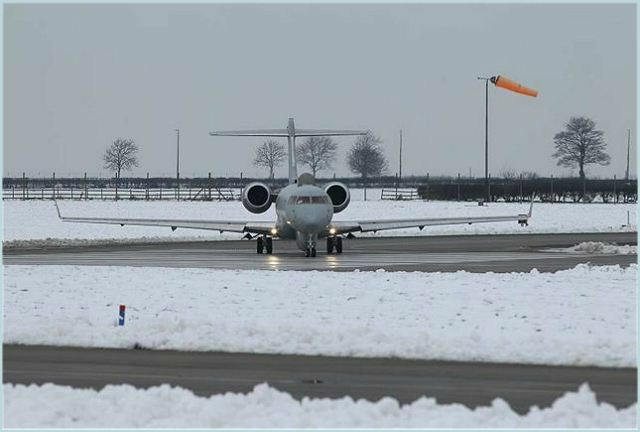 The Bombardier Aerospace-Short Brothers Global Express aircraft is an ultra-long range business jet and was modified to accommodate the radars and communications systems required by ASTOR. 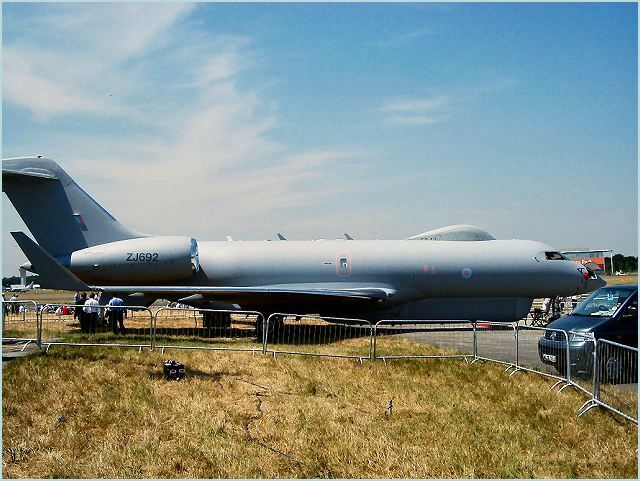 The modifications include a canoe-shaped radome under the forward fuselage to house the radar antenna, a radome on the upper fuselage to house the SATCOM antenna, a "bullet-fairing" extension on the vertical stabiliser and delta fins under the aft fuselage. The Global Express shares the Canadair / Bombardier Regional Jet's fuselage cross section and is similar in length, but despite the size similarities the two aircraft are very different due to the nature of their roles. The Global Express features an advanced all new supercritical wing with a 35° sweep and winglets, plus a new T-tail. At the heart of the ASTOR system is a dual-mode synthetic aperture radar/moving target indicator (SAR/MTI) sensor. The SAR provides high-resolution images for decision makers and the MTI monitors the quantity, direction and speed of moving targets for unparalleled situational awareness. The imagery, which can be exploited both on board the aircraft and on the ground, is passed by secure data links to ground stations at all levels of command and control. 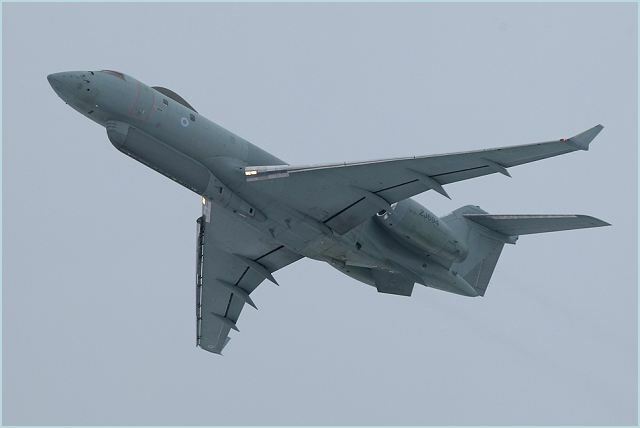 By operating at high altitude, and at considerable long range stand-off distances, the radar platform is able to remain over safe territory while providing an excellent “look-down” angle of the target area. The Sentinel cockpit has a centrally housed, pull-down screen capable of displaying a moving map, Link 16 datalink information and defensive aids subsystem (DASS) data. The DASS comprises a towed radar decoy, missile approach warning system and chaff and flare dispensers and can be operated in automatic, semi-automatic or manual mode. The main radar is a Raytheon Systems dual-mode Synthetic Aperture / Moving Target Indication (SAR/MTI) radar known as Sentinel Dual Mode Radar Sensor (DMRS). 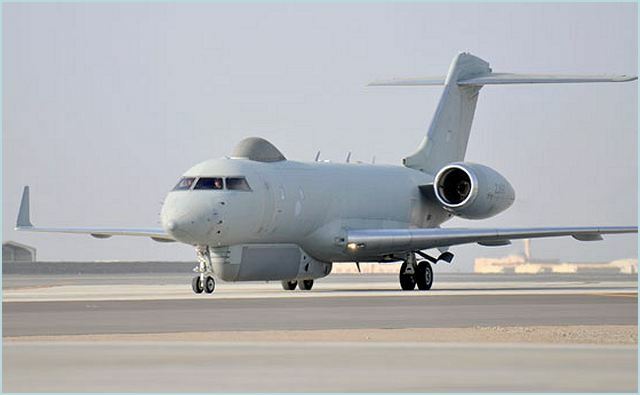 The aircraft is equipped with the Defensive Aids Group (DAG) integrated electronic warfare suite from BAE Systems Information & Electronic Warfare Systems (IEWS) of Nashua, New Hampshire. 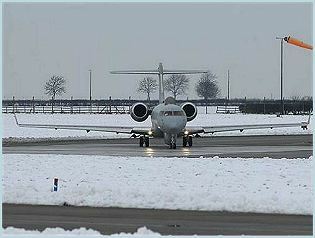 The Sentinel R1 is Powered by 2 BMW/ Rolls Royce 710 engines. Each can produce 14,750 lbs thrust at ISA +20. Max Operating altitude is 49,000 ft but usually flies at endurance at 40,000 ft. Max speed is M.89. 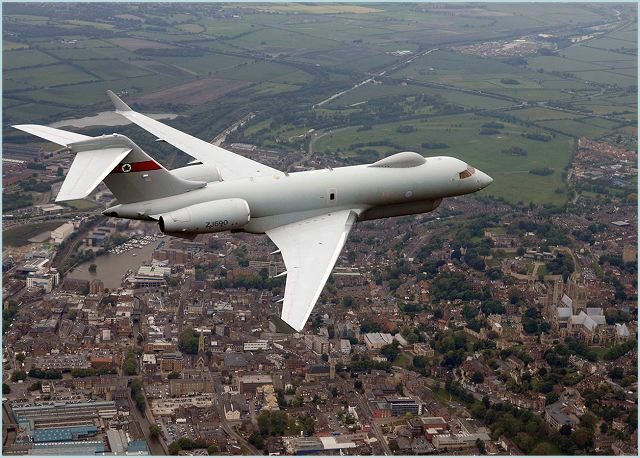 Sentinel R1 was originally intended for conventional war-fighting operations, to track armoured formations and conduct strategic reconnaissance tasks. 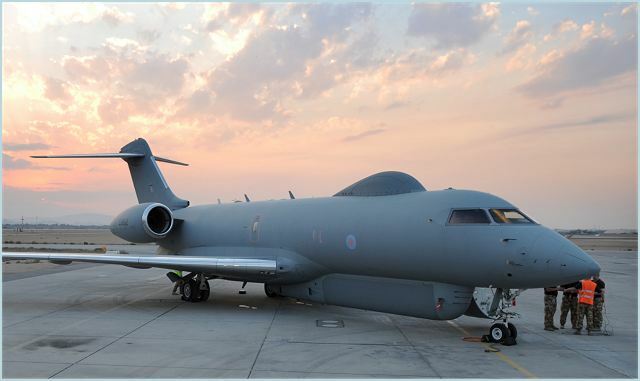 However, the capability has been shown to be flexible and has been adapted for use in a number of different roles by 5(Army Cooperation) Sqn. The Sentinel’s value has been proven in support of counter-insurgency operations in Afghanistan, and in 2011 the capability provided vital Intelligence to enable coalition air assets to protect civilians from pro-Gaddafi Forces under UN Security Council Resolution 1973. Sentinel is deployed on an enduring basis, providing International Security Assistance Force (ISAF) with operational and tactical intelligence which is having a tangible effect on the success of coalition operations in Afghanistan. 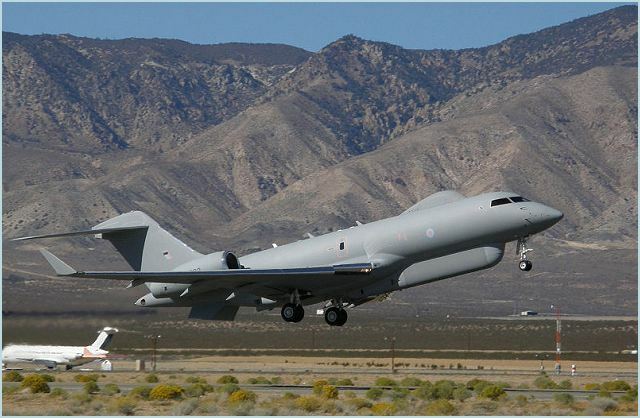 The ASTOR system capabilities have been tested extensively in preparation for operational, tactical and theater mission scenarios. 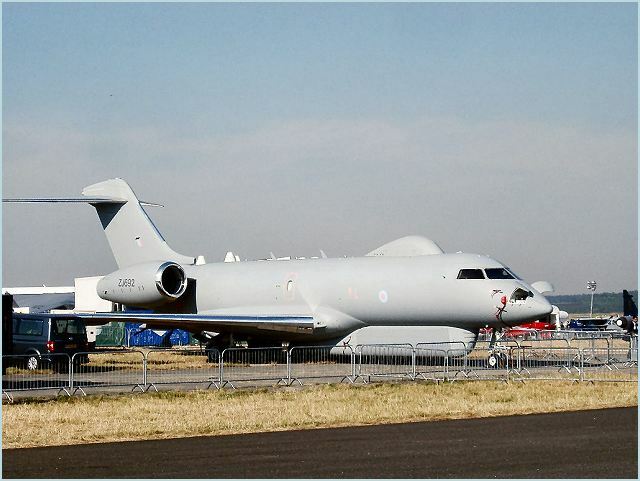 ASTOR is designed to be interoperable with NATO and JSTARS assets.